One I, but many teas. It was late and I was heating water. 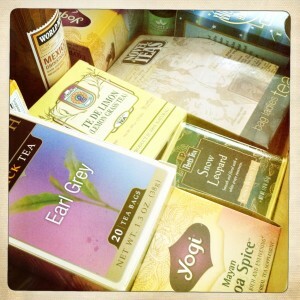 I said to the friend who was over, “Do you have a tea thought?” She came to look at her choice of flavors and laughed. “I always have a tea thought,” she said. “Ah, and the J thought, and the K thought.” We laughed, though I wasn’t exactly sure what joke I was trying to make. But clearly I was trying, and she’s easy-going. As she chose her tea (Snow Leopard), I mentally kicked myself for not knowing about the ‘I’ thought. I mean, I read that one Thich Naht Han book, most of it. And I meditate, or at least I did last year, though come to think of it there was an ‘I’ in my mantra. Damnit. But as I drank my tea (Well Rested), I let myself off the hook, because if the self is simply a mental construct, which did sound more familiar the more I thought about it, there was no I to be more or less enlightened than the person next to me. Have had that song in my head since the second I saw your title….